Sloan joined the Association of American Painters and Sculptors in February 1912 and was later appointed to the Reception and Publicity Committee for the Armory Show. But by January 4, 1913, he had become dissatisfied with the organization of the exhibition, writing in his diary: “I can’t feel interested enough to attend the meetings lately. They are going to show what they think ‘good in art’!”  Nevertheless, he exhibited two paintings and five etchings at the Armory that reflected the urban realist subject matter that made his name. 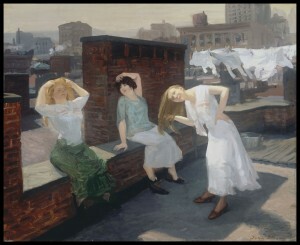 Rowland Elzea, “Sunday, Women Drying Their Hair,” in Addison Gallery of American Art: 65 Years, a Selective Catalogue (New York: Distributed Art Publishers, 1996), 468. John Sloan, Gist of Art (New York: American Artists Group, c. 1939), 233. See John Sloan, “Notes in Connection With the Armory Show,” The John Sloan Manuscript Collection, Helen Farr Sloan Library, Delaware Art Museum, Wilmington, 43; and Milton Brown, The Story of the Armory Show, 2nd ed., (New York: Abbeville Press, 1988), 83. John Sloan, John Sloan’s New York Scene; From the Diaries, Notes, and Correspondence 1906-1913, Bruce St. John, ed., (New York: Harper & Row, 1965), 628-29. “Painters’ Exhibit Approaches Salon,” Philadelphia Inquirer, February 23, 1913, 6. The American painter and printmaker John Sloan was a founder of the Ashcan school, a group of Realist artists who derived their subject matter from scenes of daily life in New York City. He participated in a series of groundbreaking exhibitions beginning in the early 1900s and throughout his career remained committed to promoting open exhibition venues for modern artists. Rallying against the prohibitive exhibition practices of the National Academy of Design, Sloan was among “The Eight” Ashcan artists who exhibited at William Macbeth’s gallery in 1908. In 1910 he played a leading role in the organization of the Exhibition of Independent Artists, “the first open, non-juried show ever held by, and for American artists.”  He continued his mission as the president of the Society of Independent Artists from 1918 to 1951. Grant Holcomb, “The Forgotten Legacy of Jerome Myers (1867-1940) Painter of New York’s Lower East Side,” American Art Journal (May 1977), 78-91, 81. John Sloan, “Notes in Connection With the Armory Show,” The John Sloan Manuscript Collection, Helen Farr Sloan Library, Delaware Art Museum, Wilmington, 43. See Milton Brown, The Story of the Armory Show, 2nd ed., (New York: Abbeville Press, 1988), 83; John Sloan, John Sloan’s New York Scene; From the Diaries, Notes, and Correspondence 1906-1913, Bruce St. John, ed. (New York: Harper and Row, 1965), 628-29; and Sloan, “Notes in Connection With the Armory Show,” 50. Guy Pène DuBois, Artists Say the Silliest Things (New York: American Artists Group, 1940), 170. See Sloan, “Notes in Connection With the Armory Show,” 1, 7, 10; and Rowland Elzea, John Sloan’s Oil Paintings: A Catalogue Raisonné (Newark: University of Delaware Press, 1991), 24.